I signed up for it, and enjoy it so far. Some more channels I'm hoping to see are AHC, Science, H2, TCM, and Nat Geo Wild. Works wonderfully on the Roku 3 in the living room. On the Roku 2 XD in the bedroom, it is slow as hell and has crashed the Roku 3 times. when you sign up for the free week, do you need to put in credit card info? The only thing preventing me from giving this a go is the lack of local sports feeds. I can't watch Sharks games without CSN California. If they can somehow encompass our two CSN networks, I'll bite and see how it sticks. I'm using a Roku 1 and it's just a little glitchy. I've found out how to get it to display the bitrates of the channels you're watching- the ESPNs are all at 4.7 mb/s, though it sometimes drops to 3.7 mb/s which is also when the frame rate drops. (Any of the more tech-savvy people out there know why I can't get it to stay at 4.7 all the time, even when my speed tests say it should be able to handle up to about 20?) The other channels seem to be limited to 3.7, with the Disney channels at 2.8. This certainly shows how good internet video CAN be, and hopefully someone will use it to start a channel that I would actually want to watch. I'd at least like to see YouTube able to display video-based material at the right frame rate, that's the main thing that's made me continue to seek out actual copies of the rare/odd stuff I've seen on there, and why people still trade DVDs of stuff I've uploaded. Yup, works really well on my Roku 3 and Roku streaming stick. There seems to be a forced "screen saver" on it, which you can set for 1, 2 or 4 hours but not disable completely. I took a nap yesterday with ESPN running (I don't care at all about sports, but it has the best picture quality out of all the channels!) and it was on the screensaver when I woke up. It shows some stills of shows currently on, coming up next and movies for rent. Another thing that I wouldn't want if I were paying for it. Pretty good deal right now, pay $60 in advance for 3 months service, get a free Roku Streaming stick or Amazon Fire stick. Or you can get $50 off the Roku 3 or Fire TV. I might do that offer, if I decide to keep it. I have a Roku 3, but have been considering a Fire. Right now I don't know if I will keep it, since it is looking like the 2nd room with a Dish hookup will be opening up soon, and when it does, I'm moving in there. While the resident has been in the hospital, I've already been using it. I wonder if the $20 a month price will start going up as they add new channels. They add a few more and I'll be seriously considering dropping cable in favor of this. Of course, the cable companies will probably get smart and start jacking up their Internet rates to customers that ONLY buy internet access. I think they'll keep adding specialty packages, but I think their goal is to keep the base package at $20. While Cable companies get paid from the provider (Dish), they also get ad revenue so more eyes always helps. Sling TV is apparently getting Epix at an undisclosed time and price. I'm betting it will be 10-15 bucks per month. Directv still won't even negotiate with Viacom to at least offer it a la carte. That deal with the streaming players is killer. Are the shows 'live' or can you stream them anytime? Depends on the channel, but it's best to assume Live only. Sling TV has some great ideas for features, such as the DVR-like ability to pause and rewind, but currently only a couple channels support that. 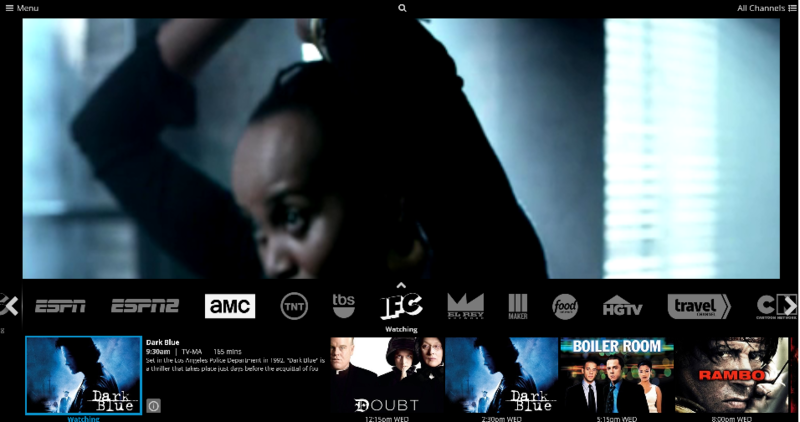 The channels that do support it also let you go back and watch whatever aired earlier On Demand, or restart current episodes from the beginning. Like I'm on HGTV right now, I can scroll back a few days and watch anything that aired whenever I want, I can also pause and rewind. This doesn't work on ESPN. HGTV, Food Network, Travel Channel, El Rey, Maker, and Gala Vision are the only ones that currently support that feature (in the Core package). Oh and there's a bunch of free Bollywood movies. I really like the setup of SlingTV, I hope very much they can expand on it. It also has a very nice overall interface, especially when compared to some of the cable boxes I've used lately. From what I can tell this is made for light TV watchers who don't use a DVR. I think this is more intended for live viewing. The thing I can't understand is why they've made it next to impossible to fast forward on the older HGTV shows. Apparently you can only ff for a second before it reverts to playing. What, precisely, does Epix offer that, say, Netflix doesn't? I look at Epix's website, and it seems as though everything they have is offered by Netflix. I think Epix has a deal with Amazon and Netflix, if you have either then you more or less have a good chunk of their library. IFC and AMC were added to the base package today. Hurray. I don't have Travel Channel on my Comcast package so I've been watching that a lot, playing catch up on No Reservations and Layover. Sling will add A&E, History, H2 and Lifetime to its core package by the end of this month.